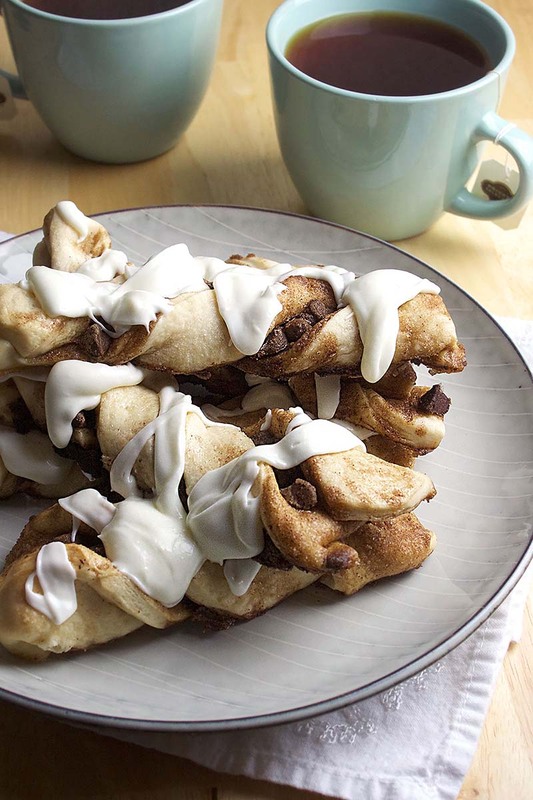 A chocolaty twist on cinnamon rolls. These are fun to make (and eat!) with the whole family! Prepare two baking sheets by lining with parchment paper or silicone baking mats. In the bowl of a stand mixer combine flour, salt, sugar and yeast. Add milk and 2 tablespoons butter. Mix with dough hook attachment for about 1½- 2 minutes or until a dough comes together. Continue to knead for 7-8 minutes. Dough should be smooth and you should be able to form it into a ball. Rub 1 tablespoon butter all over the dough ball (or coat lightly with vegetable oil or cooking spray). Cover dough ball with plastic wrap. Let rise for 30 minutes in a warm place. Make the filling: While your dough is rising, mix ½ cup melted butter with brown sugar, cinnamon and chocolate powder. Make egg wash: whisk together egg white and water. Divide risen dough in half, and roll one half into a rectangle, approx. 11x16-inches. Lay rectangle horizontally in front of you. Spread half of the filling evenly onto the dough. Cut the dough in half vertically using a pizza cutter. This will be the fold line. Sprinkle half the chocolate chips on one half of the rectangle. Lift the opposite side of the dough rectangle and fold over, placing sides with filling together. Prepare to cut 6 long strips by making a mark lightly in the dough. Cut your strips, twist them 3 or 4 times and tuck the ends under. Place on prepared baking sheet. Press down on the twists as if you are trying to flatten them a little and make sure the ends are still tucked. Brush egg wash on top of the twists and sprinkle with 1 tsp granulated sugar. Roll second half of the dough into a rectangle and repeat. Make the frosting: Combine the cream cheese and butter on medium speed. Add powdered sugar, lemon juice and milk. Mix again until smooth. Add an additional teaspoon of milk for a thinner frosting. Drizzle (or drop) over warm twists.